XS ------ 38.6"--------- 15"------------------ 20.9" ------------- 23.6"----------- 36.6"--- 34.3"
S -------- 40.9" --------- 15" ------------------ 21.3"-------------- 24" ------------- 39"---- 36.2"
M----- --- 43.3" ------- 16.1" ----------------- 21.7" ------------- 24.4" ----------- 41.3" --- 38.2"
L --------- 44.9" ------- 16.5" ------------ ----- 22" -------------- 24.8" ----------- 42.9" --- 40.2"
XL-------- 47.6" ------- 16.9"" ----------------- 23.2"" ------------- 25.6"---------- 45.7" ---- 42.5"
XXL------ 51.2" ------- 17.3" ------------------ 24" --------------- 26.4"---------- 49.2" --- 46.1"
1.There may be 1-2cm deviation because of measurement by hand. 2.Due to the light and screen differences, the item's color may be slightly different from the pictures. Please understand. Material:Cotton, Satin. Chiffon Scarf - Approx. 19.68"x 19.68" .That can be tied in your hair or around your neck. A traditional jacket for the pink satin ladies club, Perfect for Hen Parties or Pink Ladies Themed Nights. Cat eye glasses made with durable impact resistant plastic accented with rhinestones on the tips! Womens classic A-line swing dress,Perfect for Evening Occasion, cocktail party,vintage theme party,evening,ball,prom,homecoming,wedding, birthday party,church,spring or summer picnic. 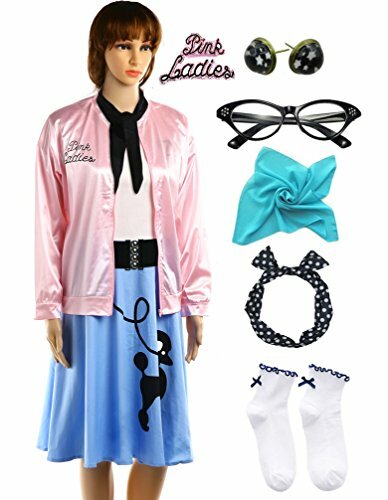 Package:1*Pink Lady Jacket, 1* Poodle Dress, 2*Chiffon Scarf, 1*White Sock, 1*Cat Eye Glasses, 1*Waistband, 1*Polka Dot headband, 1 Pair Earring. If you have any questions about this product by Hofolio, contact us by completing and submitting the form below. If you are looking for a specif part number, please include it with your message.